Hi and welcome! I’m so glad you stopped by. Have you ever found yourself struggling to focus? If you’re suffering from anxiety in your life, just plain fatigue, prolonged stress or a medically diagnosed condition like ADHD that makes it difficult for you to focus, let me share what has helped me. As a busy mom with lots of responsibilities, I struggle with balancing those things too. 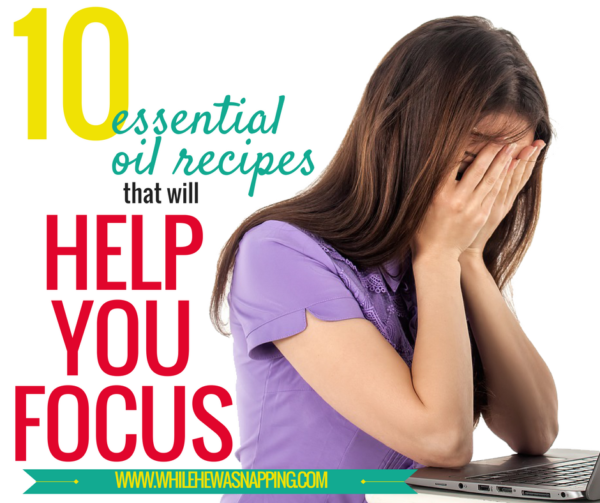 I don’t believe essential oils have magical powers that cure everything; but, I have found some essential oil recipes that help me focus and get my stuff done. Plus, I’ll share my bonus tactic that is a huge help in keeping me focused. Oh, also… I’m not a doctor, nor do I have any medical training. This is NOT medical advice. I’m just a tired, stressed out mom trying to share some of the things that help me cope and even succeed, because maybe they’ll help you too. Aromatherapy has been around for a long time and I’ve spent the last two years researching and testing essential oils in my home. Essential oils will never replace my medicine cabinet, but they do have a place within it. When I started my essential oil research, I didn’t plan to study aromatherapy. But, it has become one of my favorite uses for essential oils. Aromatherapy has been beneficial for my mental health. It’s incredible what essential oils can do for your mood. When combined with (BONUS TACTIC ALERT!) mini meditation sessions and short, focused work times my productivity has increased dramatically. find a recipe and try it. 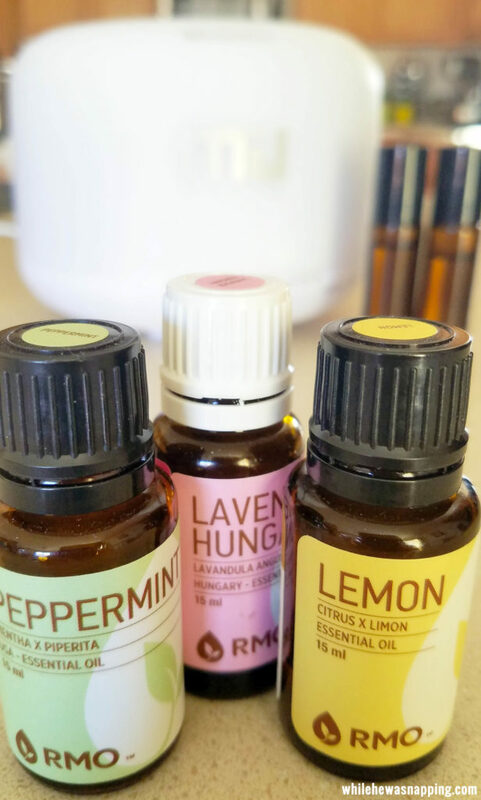 Not all essential oils have the same impact on every person, but these essential oil recipes are a great place to start to improve your focus and get things done. You may find that one method of use is more effective for you. Personally, topical application works better for me than diffusing the oils. I use roller bottles a lot, but if diffusing works for you, then do that. These recipes are simple. In all 10 recipes, there are only 6 oils. Most of the oils are common and have multiple uses – which makes me more likely to keep them stocked in my home. Imagine crawling into bed, your pillow soft against your face as you relax and drift into sleep. Your responsibilities are taken care of – to the best of your ability and you can rest easy. Tomorrow, you’ll get up and do it again. You’ll crush your to-do list. With some discipline, determination and focus you’ll be a rock star! This handy reference sheet will help you keep all the recipes in one place, neat and organized. I have a small notebook where I keep essential oil recipes and printables so, if I find a recipe that works well, I can make sure I’m able to go back and replicate it again and again. All you need to do is enter your information below to get instant access to the recipes and the premium printable. Click on the image below to download your high resolution printable reference sheet. Step #1: Add water to the max fill line in your diffuser. I like to use distilled water to help keep my diffuser clean. Step #2: Add the essential oils as directed in each recipe. Step 3#: Replace the diffuser cover and turn it on. If you diffuser allows you to set time limits or frequency of mist, do that now. You can diffuse for a couple hours or all day; however, I find it most effective when I diffuse while I am actively working on a task. Step #1: Clean and disinfect roller bottles – I run them through a cycle in the dishwasher – before use. Let dry completely. 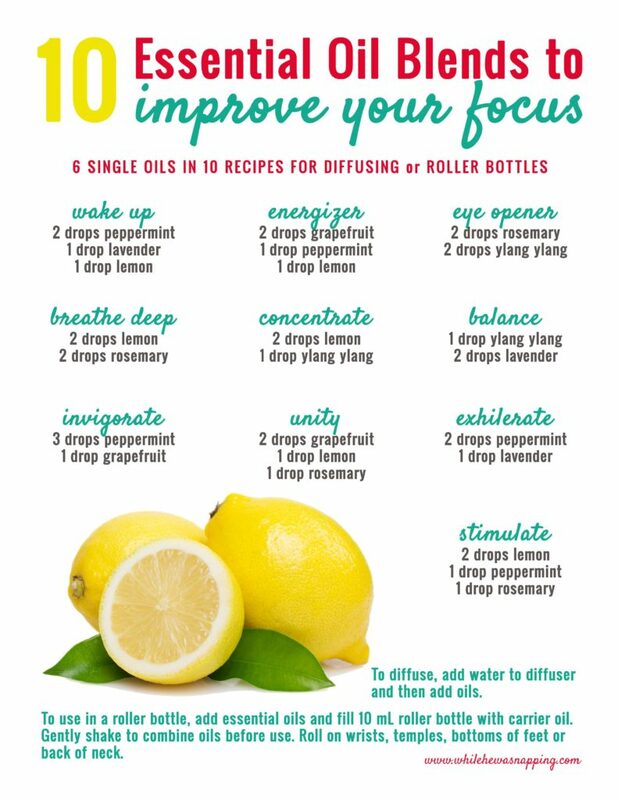 Step #2: Add the essential oils in the recipe and fill the remainder of your 10mL roller bottle with carrier oil. Fractionated coconut oil is common and works well, but I actually like grapeseed oil in my roller bottle blends. Step #3: Gently shake the roller bottle before each use to re-blend the oils. Apply to wrists, temples, back of your neck or the bottoms of your feet. Temples and wrists are my preferred locations. What are you waiting for? 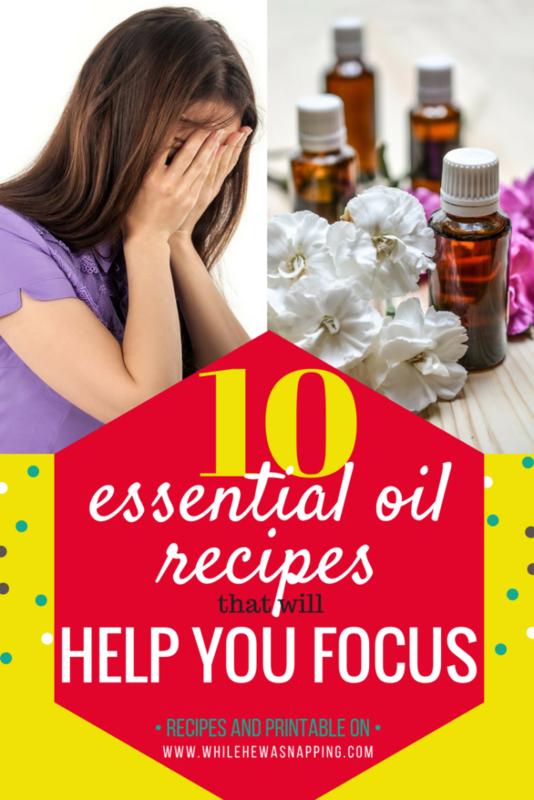 If you’re just starting with essential oils, this is a great place to try a few things. When I first started using oils, I wanted miracles and I wanted them RIGHT NOW. But, oils don’t work that way. Be consistent and willing to try other methods to find the one that is right for you. You’ll find your focus and things will get done. And you’ll feel better too! I use Rocky Mountain Oils. I love their guarantee and return policy. The quality of their oils is comparable to the other expensive brands I’ve used before while being a little easier on my wallet and budget too. They are affordable and effective – and, my favorite part, there’s no MLM structure so you can order what you need when you need it.